Chinese President Xi Jinping on September 1 held talks with Egyptian President Abdel-Fattah al-Sisi ahead of the 2018 Beijing Summit of the Forum on China-Africa Cooperation (FOCAC). The two leaders agreed to jointly advance the China-Egypt comprehensive strategic partnership for greater development in the new era. Egypt is a representative of Arab states, Africa, Islamic countries, major developing nations and emerging economies, with increasing influence in international and regional affairs, Xi said. Noting that China highly values developing the comprehensive strategic partnership with Egypt, Xi pledged to continue to support Egypt in its efforts to maintain stability, develop economy and improve people's livelihood, in pursuing a development path in line with its national conditions, and in playing a bigger role in international and regional affairs. China is willing to strengthen strategic communication and coordination with Egypt and safeguard their common interests, Xi said. He called on both sides to continue to support each other on issues involving their respective core interests, timely exchange views on bilateral relations and major issues of common concern, share the experience of governance, and strengthen exchanges at all levels and in various fields. 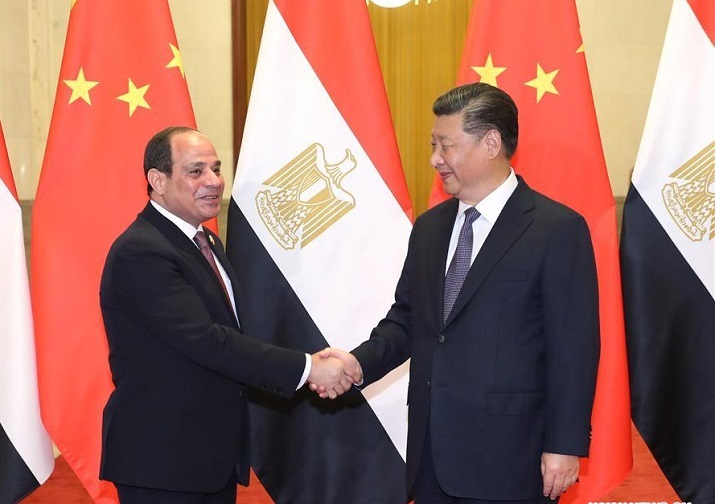 Stressing that China views Egypt as an important and long-term partner of cooperation in the development of the Belt and Road Initiative, Xi said China is willing to align the initiative with Egypt's Vision 2030 and Suez Canal Corridor Development Project, promote pragmatic cooperation between the two countries, and enhance collaboration in counter-terrorism and security areas. Both as countries with ancient civilizations, China and Egypt should jointly promote dialogue and communication in this regard, Xi said. Noting that Egypt and China maintain traditional friendship and a high level of mutual trust, and hold similar positions and closely coordinate with each other on major international issues, Sisi said Egypt places priority on the comprehensive strategic partnership with China. As one of the earliest countries that support the Belt and Road Initiative, Egypt firmly believes that the initiative will create enormous opportunities for their bilateral cooperation as well as international and regional cooperation, he said. The president said Egypt will continue to support and participate in the Belt and Road Initiative and, as the incoming holder of the African Union rotating presidency, it will also continue to promote cooperation between Africa and China. Stressing that development is what African nations need most, Sisi said the Beijing Summit of the FOCAC demonstrates that China attaches great importance to Africa's development. Egypt fully supports China in hosting a successful summit, he said. Egypt speaks positively of China for upholding a just stance on the Middle East issues and is ready to strengthen coordination with China in multilateral areas, Sisi said.